Cryptorchidism in dogs. Undescended testes - Will the hidden testicle come down? A cryptorchid dog is one that has a testicle that hasn't descended. In some cases, dogs can be bilaterally cryptorchid which means that neither testicle has descended. The word cryptorchid is a latin word which means, "hidden flower". This is appropriate, as one or both of the dog's testicles will be hidden! The testicle starts out in the abdomen, just behind the kidney. It then travels down through the inguinal canal and ends up in the scrotum. 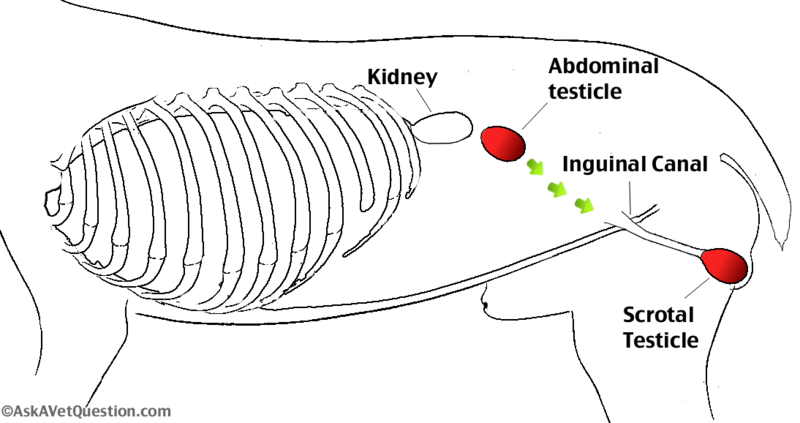 Every animal is born with gonads inside of the abdomen, not far from their kidneys. 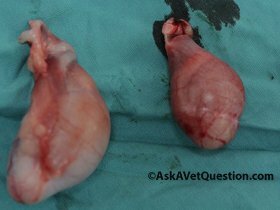 When an animal has a Y chromosome, the androgen produced causes these gonads to become testicles. (If there is no Y chromosome, then they become ovaries and stay permanently inside of the abdomen.) While the animal is still a fetus, increasing amounts of testosterone in the system cause the testicles to start their descent into the scrotum. It is believed that the rising testosterone level causes contractions in a ligament called the gubernaculum. The gubernaculum connects the testicles to the scrotum and the contraction of the gubernaculum pulls the testicle into the scrotum. On its way, it travels through the inguinal canal. At what age should the testicles be down? Most normal puppies will have two testicles in the scrotum by 6 weeks of age. However, in some dogs it can take up to 4 months to appear. In rare cases, it will take up to 7 months. If one or both of the testicles are not in the scrotum by 7 months then it is extremely unlikely that it will appear. Yes, this is definitely a genetic condition. This means that affected dogs should not be bred. It is believed that this is an autosomal recessive trait. However, we don't know this for sure. If a cryptorchid male is bred, he is extremely likely to produce male puppies that are cryptorchid and female puppies that are carriers for cryptorchidism. A female dog can be a carrier for cryptorchidism and can produce puppies that are cryptorchid. It is considered unethical to breed a dog that is either cryptorchid or a carrier for cryptorchidism. Can a cryptorchid dog breed? Most cryptorchid dogs will have reduced fertility. However, they still can breed and produce offspring. But, as mentioned above, a cryptorchid dog should not be bred for ethical reasons. We don't want to produce more dogs with this genetic condition. Health concerns for cryptorchid animals. The cryptorchid (hidden) testicle is often much smaller than the healthy testicle. In this photo, the testicle on the right was found in the inguinal canal. Cancer: A retained testicle is 13 times more likely to become cancerous later on in life. Testicular Torsion: A retained testicle can suddenly twist around in the abdomen and cut off its blood supply. This is a life threatening and painful emergency. Behavioral problems: Dogs with cryptorchidism will often have more testosterone related behavior issues than regular dogs. We believe this is because the retained testicle has more blood supply because it is at a higher temperature when it is in the abdomen. This means you may see an increase in aggression, urinating on things, mounting things, etc. How much does cryptorchid surgery cost? ***These prices may vary in other veterinary practices. The price may increase if a dog has both testicles hidden rather than just one, or if an abdominal testicle is really difficult for the vet to find. 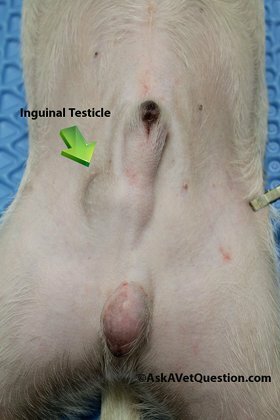 This dog has one scrotal testicle and one that is in the inguinal canal. Photo by Dr. Marie.